3. 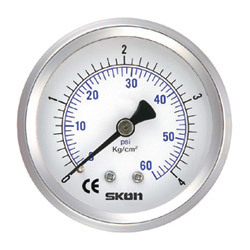 Cpressure range: -1/0 to -1/+20 kg/cm² (bar), 0/1 to 0/1000 kg/cm² (bar). 4. Operating temperature: working temperature: 60℃, Ambient: -25℃ ～60℃. 5. Connection: Aisi 316, lm/lbm/cbm, thread connector:22mm 3/8’’, pt, npt, pf, bsp 1/2’’, pt, npt, pf, bsp. 6. Sensing element: bourdon tube, Aisi 316, DIN 50049(AISI 316 Ti), ＜ 70kg/cm² (bar) c, ≧ 70kg/cm² (bar) h.
8. Dial: aluminium with white back ground & black lettering. (1) normal glass. (2) acrylic. (3) laminated safety glass. 14. Order options: silicon filling, flange, red mark pointer, U-shape clamp, L-shape clamp.